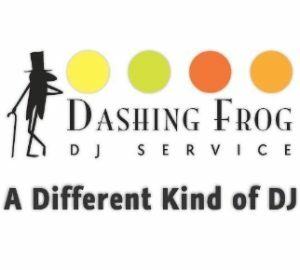 Get A FREE Brochure from "Dashing Frog DJ Service"
We are your Wedding DJs- not actually frogs. We are Bryce and Karilee Gardner and have been married for over 18 years, and we LOVE weddings. Both of us love the joy and happiness found in new marriages. We love being a part of that joy and happiness. We would love to be your Wedding DJ. Through nearly 20 years in the Wedding DJ industry, we have learned a very important concept. We’ve learned that in your face, flashy DJ’s with plastic maracas and YMCA hats are pretty cool. But they just aren’t for everybody. Our philosophy is something that we call “Subtle Sophistication.” We put the focus entirely on you and help you create a fun and entertaining event that you and your guests will love. And we do it without the props and gimmicks. It’s a pretty awesome concept, right? We’ve heard way too many horror stories. Wedding DJ’s that show up late. They don’t have the right music. They are dressed completely inappropriately, and so on. It’s sad, and it happens far too often. Rest assured that we are not like that. We have adopted a set of professional Wedding DJ standards and ethics so that you will never have your own horror story to tell. 1. You will be treated with the utmost respect. 2. Your guests will receive that same respect. 3. Solutions will benefit you, not our bottom line. 4. Your satisfaction is our highest priority. 5. Your time is very valuable, and we treat it as such. 6. We will always be on time. 7. We always dress professionally and appropriately for your event. 8. Our DJ will not flirt with your guests. 9. We will be prepared for all aspects of your event including music selection, event timeline, etc. 10. Inappropriate music will NOT be played at your event. We would love to be your Wedding DJ. Please mention Salt Lake Bride when you contact Dashing Frog DJ Service.